When you plan on entering into reenactment events or actual combat, good armor is a must-have for any warrior. And this Medieval Sporting Cuirass is made for the rigors of combat from good, hardy steel, to ensure that the wearer stays safe. This breastplate and backplate combination consists, predictably, of two different parts. The breastplate is made entirely from 16 gauge stainless steel and features wide, open arm openings, so that the armor does not restrict your movement in the slightest, while also possessing a unique shape and form that is best made to accommodate interior padding, as well as to resist impact. The breast of the plate is also adorned with a little, accent curve, which serves as both decoration and added defense against impact. The breastplate also possesses hinged sides. The backplate is made entirely from fine leather, and both pieces feature the matching leather straps and buckles necessary to wear the piece comfortably and effectively. 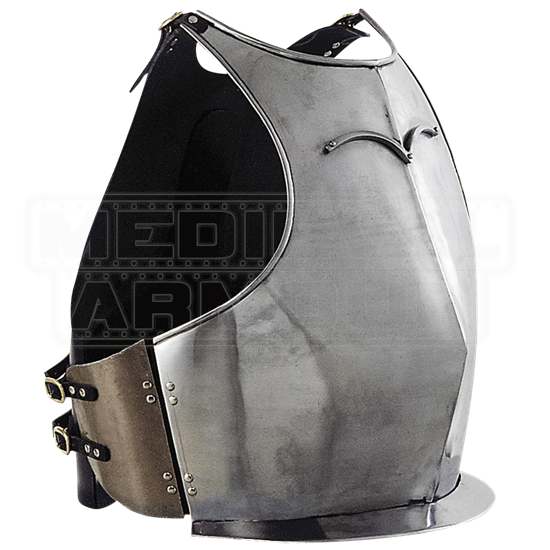 The breastplate is offered in one size, although the buckles, and the hinged sides, offer a bit of adjustable fitting that allows this breastplate to fit most with ease. The thickness of this Medieval Sporting Cuirass makes it a solid choice for SCA reenactments and events, as well as a good start to any armor that will be put through the paces of light to moderate combat.